What are Black Labs allergic to? Labs, perhaps more than other dogs are prone to skin allergies. This being said does not necessarily mean that if you have a lab that it is going to get skin allergies. What it does mean, though, is don’t be surprised if it does. It is common for a lab to develop Canine Atopic Dermatitis. Canine Atopic Dermatitis is a very common allergic skin disease which affects a significant number of Labrador retrievers (more than 10%). It causes mild to severe itching, which, as a result of scratching or rubbing, can lead to further skin damage, irritation, infection and discomfort. This is a genetic disease which Labs seem to have a good chance of either being a carrier or affected by symptoms of the disease. Allergic diseases result from an exaggerated immune system response that causes pathological damage (itchy sensitive skin and rashes) associated with antibodies most commonly directed against environmental allergens such as house dust mites, pollen, insects or household chemicals including fragrances. Treatment varies from controlled environments to drug therapy. If you suspect that your dog has allergies, it is bet to seek advice from a veterinarian. What age are Black Labs fully grown? Labs reach physical adulthood between 12 and 18 months. Mentally your dog is still basically a pup until the end of their third year. Our Guinness, a 5-year-old male, stopped growing when he turned about 4. At 4 he was about 90 lbs and now at 5 he is right at 100 lbs. In the last year he actually filled out. He is by no means fat, but in the last year became more muscular and broader shouldered. Guinness is large for a Black Lab. Most males can get up to 24″ in height and 100 lbs max. Females are most often a bit smaller.. 22″ in height and up to 70 lbs. These sizes are generalizations though. My son Tanner had a Chocolate Lab (Koda) who reached 135 lbs and was very well proportioned. 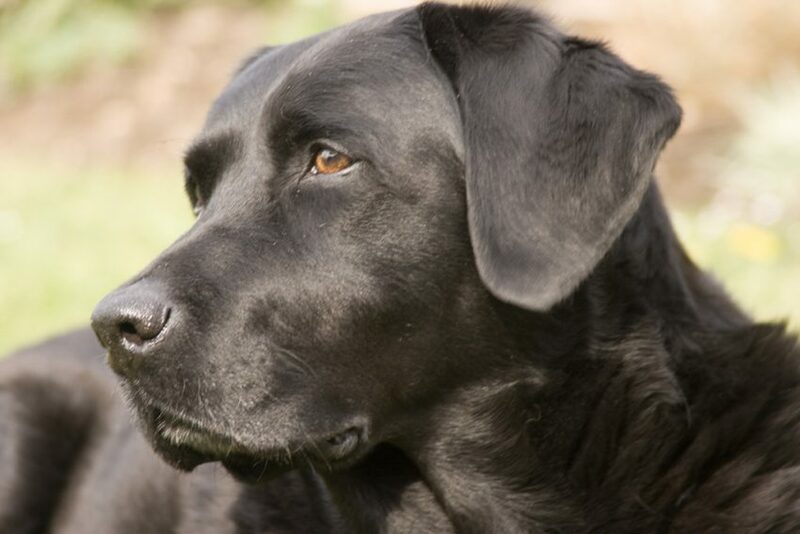 You can expect your Black lab to live between 12 – 14 years. Some sites say 10 years, but I think that if you feed your lab good food and is cared for well that they should easily live 12 – 14 years. Some live longer than that. We have a friend with a lab that is 19 years old and doing well. Even though this is an unusually long life span, it does show that with correct care and certain amount of good genetics that a long life is possible. Do full-blooded Black Labs have white on them? This is one of the most FAQ about Black Labs that I have been asked. The answer is a resounding YES!. desirable. White hairs from aging or scarring are not to be misinterpreted as brindling. Black: Blacks are all black. in shading on the ears, back, and underparts of the dog. from light to dark chocolate. Chocolate with brindle or tan markings is a disqualification. 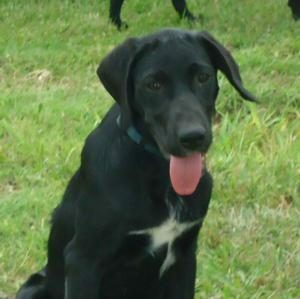 Can a Black Lab have other colored puppies? This comes from a really interesting article by Stacey Venzel, titled What Determines the Coat Colors of Labrador Retrievers? This is an amazing article and very interesting. I highly recommend reading it if you have an interest in reading about the possibilities and color combinations when Labs breed. Can a Black Lab have blue eyes? They can have blue eyes but they are probably not fulled blooded. According to the AKC Labs should have eyes that range from a yellowish brown to dark brown. Any other color from blue to green and tints in between will disqualify the Lab as pure bred. There is a controversial lab called a Silver Lab. A Silver Lab can have various eye colors to include the blues and greens. 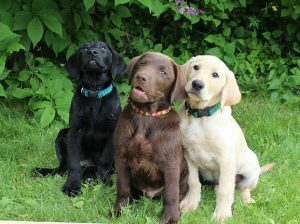 At this time however, those colors are not considered a trait of a pure blood Lab. If your Lab is a pure bred with blue or green tinted eyes, you may want to check with your veterinarian to see if the dog is having eye problems or if there is possible genetic issue with the dogs blood line. 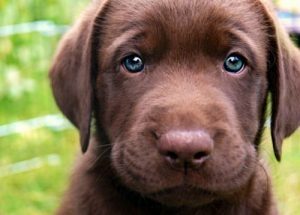 Please note that a lot of times, even a pure bred lab can have blues eyes as a puppy, but will change to the darker brown as the dog gets older… generally around the age of 4 months. 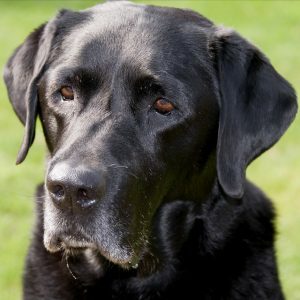 Will a Black Lab protect its owner? Labradors are bred to be very loyal dogs. And because of this loyalty a lab learns early on to be assistance to the alpha members of the “pack”. This being said it is only understandable, despite their friendly and gentle nature that they are also very protective of their territory, caretakers and family members. A lab is not timid in letting a stranger know that they are aware that something is out of the ordinary and will be defended if needed. Even though you may train your dog that he does not need to bark at everyone and everything, if a stranger were to come inside your house when you were not at home, they would defend it with there life as if they were defending you… all because of the extreme loyalty they feel that is a naturally inbred into them. Can a Black Lab live in an apartment? My feeling on this is – It depends. A lot of people say that because a lab is so trainable that they can do well anywhere. They do bark and with all the exterior environmental sound in an apartment it may cause them to bark more often as a protective measure. I would be in fear of making my neighbors unhappy if this were the case. Black Labs are a sporting dog. As a sporting dog they need to run and have wide open space to exercise. Unless an apartment liver is going to take the time to take the dog to place where they can get this exercise, it truly does a disservice to this breed of dog. A lab is loaded with energy. 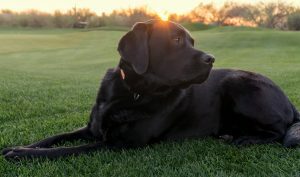 Not to say there are not a few lazy labs out there, but generally they have been bred to run all day long and love it. Labs will chew. They will chew on things for several different reasons. Boredom, teething, lack of exercise, anxiety and simple nautiness or lack of training to name a few. Labs shed like crazy. If you have a lab in your house be prepared for the massive quantity of hair that is constantly being shed for this breed of dog. Then add to that the hair that is multiplied seasonally in the fall and in the spring. Labs are also very people oriented and social. They really need the interaction of there masters to be happy. If they are left alone for long times in small spaces they will become depressed and experience a wide variety of emotional based behavior issues. You will need to make potty training a priority. A priority. You can adapt a lab to live in your apartment, but my feeling is that unless it is a service dog, you would be better off getting a smaller dog. 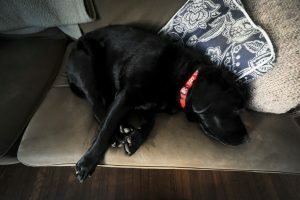 Yes, a lab can learn to live in an apartment and be happy, but understand that this will take a lot of time, dedication and patience from you in order for both you and your dog to be happy, comfortable and healthy in a small space environment. Can Black Labs be aggressive? That question is kind of an open ended question. Can they be aggressive. Yes. Do they have any natural tendency to be aggressive, No. Black Labs by nature are good natured and well mannered and friendly. 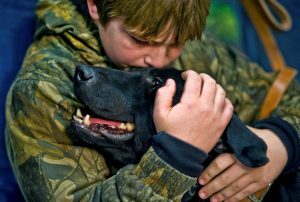 Usually the only time were we experienced a Black Lab being aggressive is when it was afraid, hurt or was being protective to people or territory. 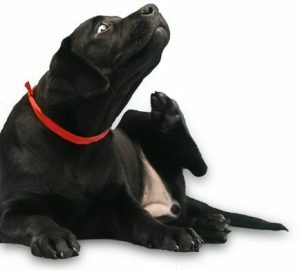 If your Lab is acting strangely aggressive, try to observe his movement and actions, is he hurt? Can you tell if he is in pain anywhere? Are there people or animals present that he does not recognize? Is there a reason that he is afraid? Most Generally a lab in its own environment and with its normal handlers do not act aggressive, on the contrary they are friendly and happy. One of the factors that there is evidence to is that Labrador puppies that are taken away from there mother before a minimum of 7 weeks that there is a greater chance that they will develop aggressive traits. Bad experiences can also lead to aggressive behavior in labs. If a lab was harassed excessively by another dog in his household, it could make him react fiercely to all canines. 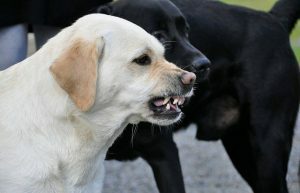 Insufficient socialization in general can contribute to aggression in Labrador retrievers. 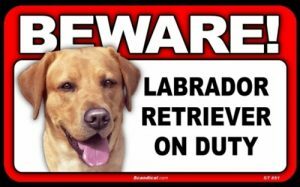 When a lab behaves in a truculent or unusually scared way, he’s acting in a manner that’s not characteristic of the breed, as noted by experts in canine behavior. Is a Black Lab a good family dog? I feel, from my experience with all kinds of dogs for all kinds of purposes that a Black, or any Labrador Retriever makes an awesome wonderful member of a family. They are loving and kind, loyal and smart, protective and east to train. You really can’t ask for a better dog. They will stay by your side through thick and thin. They will love you when you are down and play with you when you feel energetic. They enjoy long hikes in the woods and sitting next to you by a warm fire. Take care of your dog, feed them good food and pay attension to their emotional needs and you will have a rewarding experiance with a good companion for many years.